Professors Danielle Champney, Todd Grundmeier, Dylan Retsek and Stan Yoshinobu are collaborating on a $2.8 million National Science Foundation-funded project to expand the professional development capacity of the mathematics profession. This five-year project is in its second year, and during the summer of 2017 they will organize three Inquiry-Based Learning workshops in collaboration with 15 other facilitators across the nation. 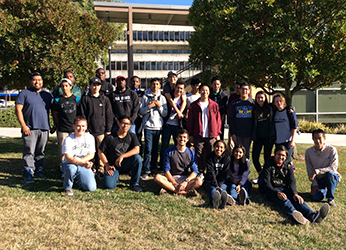 In June 2016, students from Da Vinci High School in Hawthorne, Calif., visited Cal Poly to showcase robots that they designed and built in response to a problem designed by Cal Poly math students Curtis Li and Alvaro Matias, engineering students Lucas Dodd and Vitto Monteverdi, and faculty advisor Danielle Champney. The Cal Poly team designed a two-month long project to build a robot that could rescue a trapped faculty member in the engineering quad by navigating several obstacles by remote control. The Cal Poly team also served as mentors for the high school students for the duration of the project along with math student Brian Keating, and helped the high school students troubleshoot their mathematics, physics and engineering questions. During the academic year, the project expanded to grades 9-12. Math students Hayley Cushing, Maria Ramirez and Nick Rubio; engineering students Kara Hewson and Gloria Whang; and physics student Max Yarbrough mentored the high school students. 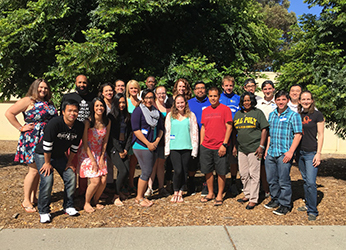 Todd Grundmeier and Elsa Medina offered two three-day mathematics workshops for 47 Noyce Scholars during summer 2016. The workshop is designed to provide a support system for these future and current mathematics teachers and an opportunity for them to discuss the teaching and learning of mathematics. The workshop is funded by a National Science Foundation grant that provides $12,000 or $24,000 scholarships to future mathematics teachers who make a commitment to teach in a high needs school district. Noyce Scholars also receive $800 for attending the summer workshops. Elsa Medina and Noyce Scholar Ben Woodford (B.S., Mathematics, ’12; Single Subject Credential, Mathematics, ’14) presented the results of National Science Foundation-funded work by Medina and Todd Grundmeier in a presentation titled "A Model for Continued Support for Math Scholars" at the 2016 Noyce Summit in Washington, D.C. Woodford was selected from a nationwide pool to be part of a panel presentation at the conference and represented Cal Poly's Math Noyce program. 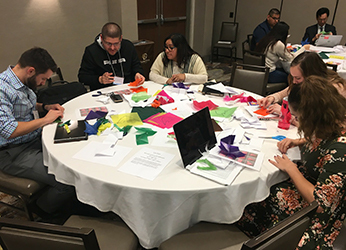 Elsa Medina, Amelie Schinck-Mikel and undergraduates Maria Ramirez and Hayley Cushing gave a presentation titled "Using the Fold-and-Cut Theorem to Engage Students in Mathematics" at the Western Regional Noyce Conference held in Fresno, Calif. 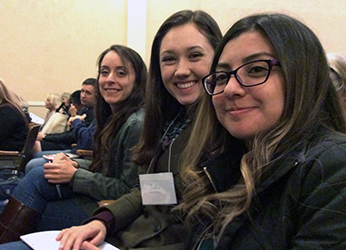 Math students Roxanne Windover, Julia Gladding and Maria Ramirez attended the 2016 December California Mathematics Council North conference for math teachers and educators. 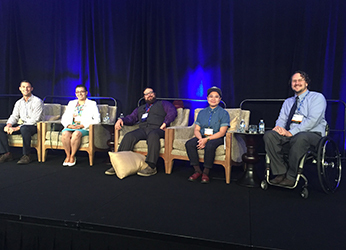 Elsa Medina, Danielle Champney and four students who are preparing to become mathematics teachers attended the annual California Mathematics Council Conference held in Pacific Grove, Calif. 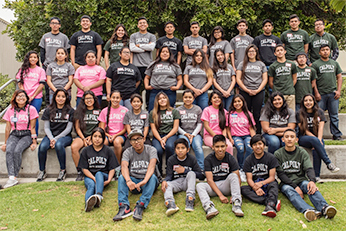 The fifth annual Cal Poly Math Academy, directed by Elsa Medina and Amelie Schinck-Mikel, welcomed more than 40 Hispanic students from local high schools to campus this summer. For one week, students solved challenging mathematics problems through hands-on activities. Students also had the opportunity to explore the campus, heard from a campus police officer about forensic science, asked questions of members of the Society of Hispanic Professional Engineers, and toured the agricultural facilities. The academy, which is supported by the College of Science and Mathematics, aims to inspire students to pursue careers in science, technology, engineering and mathematics (STEM) fields and to recognize and enjoy the beauty of mathematics. The Central Coast Middle School Science Bowl was held at Cal Poly on Saturday, February 25th. The Regional Science Bowl competition is an annual, fast-paced, question-and-answer contest in which students answer questions about Earth, physical, life, and general sciences, and math. Eighteen teams from eight middle schools participated. Although Science Bowl tournaments have been taking place on the Central Coast for several years, this is the first time that this competition was held at Cal Poly. The competition was organized by Paul Choboter (Mathematics), Jenny Cruz (CESAME) and Jason Diodati (Templeton High School). The event was generously supported by CESAME, and local community sponsors included IQMS in Paso Robles, MindBody in San Luis Obispo and RSH Construction in San Luis Obispo. The members of the winning team from St. John's Lutheran School in Bakersfield, Calif., received all-expenses paid trips to Washington, D.C., to participate in the National Science Bowl. The U.S. Department of Energy, Office of Science, manages the National Science Bowl and sponsors the finals competition.